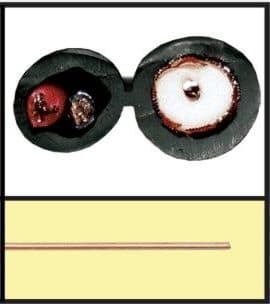 RG59 Siamese cable (1) 1000 Foot Spool, is a heavily shielded cable which contains a COAX video and pair of 18 gauge 2 conductor power in one jacket. The RG59 cable that CCTV Camera Pros supplies have a solid copper core, 95% copper braided shielding, and 75 ohm impedance. This is the gold standard of cable for CCTV and HD CCTV installations. The advantages to using RG59 cable is that its more durable and can be run in long distances without interference. You can also cut each security camera run the exact length that you need. You will need to attach BNC connectors to each end of the RG59 coax part of the cable for the CCTV video transmission. BNC connectors are available in twist on, crimp on, and compression types. 500 foot spools of RG59 are also available. Watch this video to see how to attach a BNC crimp on connector to RG59 cable. 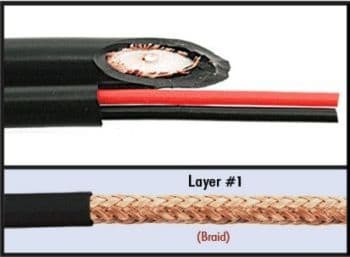 The following tools can be used to strip the RG59 coaxial portion of these cables and crimp on BNC crimp on ends or other crimp type cable ends. Want to learn how to install a security camera system using RG59 Siamese cable? Check out our RG59 Siamese cable wiring & installation guide for analog CCTV and HD security cameras. 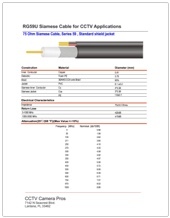 Download the cable specification here.